About 13 years ago my daughter returned home from a neighbor’s Christmas party. She had met a woman who said that her neighbor had a family of feral cats that she wanted someone to trap. After hearing the story I called the people to tell them that I would trap the cats for them if they were willing to pay for the spays and or neuters and vaccinations of the cats. So I set out two traps and within days I had trapped the mother cat and three kittens. My vet could not immediately do the spay/neuters and I had to keep the cats in special cages for several days. During that time I noticed that the long haired black and white kitten was smaller and not nearly as perky as her litter mates. I took the mother cat and the two healthy kittens to my vet who spayed the mother and a female kitten and neutered a male kitten. I returned the cats to the people but kept the little black and white one that did not appear healthy. I put her in a larger cage in a spare bedroom where I began feeding her high quality cat food. Her appetite was poor and she seemed lethargic. In addition her breathing pattern was rapid. Within the time span of a weekend her condition went from what I considered puny to very ill.
On Monday she refused to eat. Her respirations were quite rapid and shallow. I was extremely distressed and by the time my vet, Dr. M. saw her mid-morning I was afraid she was going to die. Dr. M. did a thorough exam, drew some blood, and then took some x-rays. He told me that her white count was high, the spleen enlarged, and that her lungs had some type of infection. He had never seen a young cat with what he called a peculiar looking x-ray. He could not discern the pattern but he had every intention of finding out what was wrong with the little cat. He prescribed amoxicillin drops and a liquid vitamin with iron. I was instructed to wait about two hours between the two medications because the iron would interfere with the absorption of the amoxicillin (a type of penicillin). The next day Dr. M. called me at home and asked me to come to the clinic so that he could show me the x rays and explain Josie’s illness. I drove the 4 miles to the clinic expecting something really dreadful. Dr. M. had one of the x rays on the screen. He pointed to her spleen and then said,”I spent a couple of hours or more last night going through this book” which he pointed to on the counter. “It is my go to book when I have something that I don’t know.” He then went on to explain that Josie’s x ray matched exactly, the photo in the book of a cat with histoplasmosis. I then said, ” are you saying that animals get the same disease as humans?” And of course his answer was “yes”,indeed cats and dogs get “histo” which is a fungal disease that is mainly found in the Ohio and Mississippi river valleys- where it is very humid and of course that is exactly where the fungus thrives in areas that have long periods of rain and humidity. (There has been an increase in the number of cats and dogs diagnosed with this disease in recent years. Veterinarians have become more aware of the disease via seminars, journals, or are grads from vet school the past 20 years or so.) I knew that Josie had been born and raised in pile of wood and debris near a creek so that explained her exposure to the fungus. As we were talking I literally had begun wringing my hands for I feared the worst possible outcome. However, Dr. M said he had good news- the disease was treatable but that it would take at least 2-3 weeks before she would begin to show improvement. “The medication is going to be in liquid form and I have called a pharmacy that knows how to compound.” Dr. M. also told me to force feed her if she refused to eat. The medication is called itraconazole (a human medication that is compounded into liquid form) and she would receive her dosage which he had calculated on Josie’s weight. The med was ready the next day and it was not cheap. But 13 years years ago it was around $45 for a two months supply. Itraconazole is an anti-fungal medication. It is available in oral capsule for humans or turned into liquid form so that a precise dosage can be given to a pet. The med is prepared flavored with tuna or chicken at the pet owner’s request. The road to controlling this disease in Josie was extremely rough for about 3-4 weeks. I kept Josie in a large cage since she was still semi- feral and very ill as well. I need to make it clear that histoplasmosis is not contagious; it is not transmittable animal to animal or animal to human and vice versa. Josie looking much better. She doesn’t appear ill in this picture, however she is still very sick. She has episodes of looking really alert. I’ve been on pins and needles for about 9 days since my cat Josie relapsed with the fungus from hell. Josie was 5 months old when she was initially diagnosed with the the disease. I wrote an earlier post about histoplasmosis and you can read all about it there. I’ve been very afraid that it could take her out. One day she was okay and the next she was breathing with significant difficulty. Dr D. called a script to a compounding pharmacy so she has been on the actual liquid Itraconazole for 7 days. I had one emergency capsule that I emptied onto a plate and then just divided the little beads into what could roughly pass for 1/3 of the total amount in the capsule. I then used a pat of real butter to pick up the tiny granules and then carefully transferred that over to the back of her mouth. She is easy to medicate since taking medication every few years to knock down the histo. (It is never completely gone. Little bits of the fungus live in some of the cells in the body. I have kept her on Itraconozole for as long as 1 and 1/2 years each time that she relapses. Dr D. told me to keep her on it all the time but I wanted to give her liver a rest and her lungs were clear in the spring of this year ( via x-ray by my vet) here in my town. Anyway to get on with the story she has improved but still has rapid respirations which are not as labored. I will keep her on the med from now on and get some blood tests for her to make sure her liver is okay about every 4 months. I am always afraid that the med is not going to work for it takes about 2-3 weeks for it to reach saturation point. (other antifungal meds are available) When Josie became ill last week she weighed 10 pounds but she is down to eight pounds now. But I am still giving her 1ml of the medication. If she loses more weight I will need to call Dr. D for an adjusted dose. This disease really takes a toll on the animal. Josie is eating fair with the help of B12 and B complex which I have given subcu (under the skin and between the shoulder blades) once since she became ill. She is due for another B12 tomorrow. For the secondary infection in her lungs I am giving her Baytrill (enrofloxacin) which is a potent antibiotic and a med that is used for humans as well. Both meds are given once daily. I will post updates every few days. In addition to the above: she is grooming herself and that is a good sign that she has improved some. Dancer, I'm in heaven now." 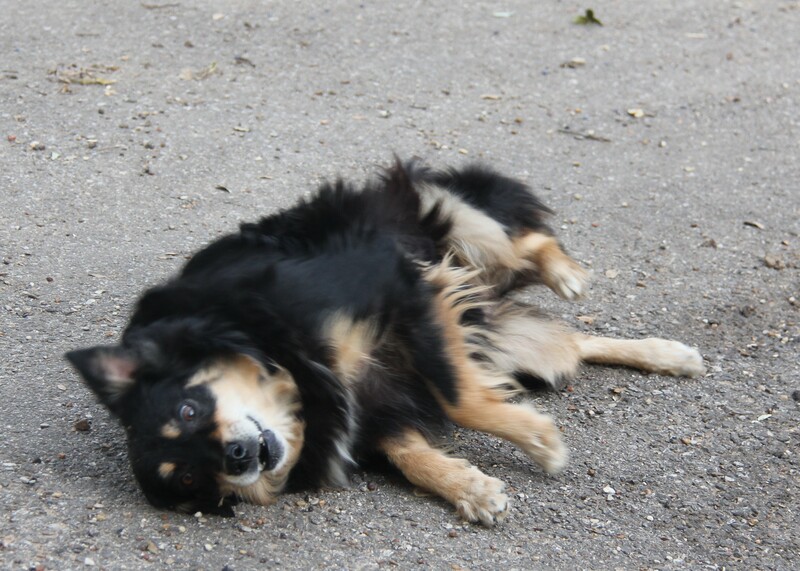 My Australian Shepherd, Dancer that was saved from euthanasia in Ft. Worth, Texas, a city run kill shelter, loooves to roll in the dirt or on the asphalt driveway of our property. She has a chronic fungus condition and really needs a bath at least every 2 weeks (every week would be better.) At times her back feels itchy and she then rolls in the dirt or on the rough asphalt. In between bath times she rolls each time I let the dogs out to play and run around the one acre property. I took a series of pics one day as she was rolling and here they are, from beginning to the finish. My camera numbers my photographs so these are in sequence. I am still working on a post re: cat diseases. Dr. D asked me to write about Feline Leukemia and Feline Infectious Peritonitis. I have begun writing about each of these deadly diseases. She told me to make these short and I have great difficulty with brevity. These diseases are so depressing that I don’t have the “git up and go” to finish them. FIP is fatal. Feline Leukemia is generally a killer also although there are some treatments that can buy the cat some time. Either way these diseases are depressing to write about. Many years ago, I lost several cats to Feline Leukemia. That was before the vaccine for that disease was available. The cats were all strays that had found their way to our house. All had been neutered or spayed and vaccinated for other cat diseases. Now there is a vaccine that is about 90% effective for Feline Leukemia. There is also a vaccine for FIP but debate is still on-going re: its efficacy. Bobbie, "Wow! What a view. I should do this more often." Bobbie checking for options- pounce or not to pounce. Bobbie is now about 13 years old. She still enjoys playing and loved looking through the peep hole. This was a new cat tree that I had bought at Pets Mart on black Friday, the big sale day after Thanksgiving. She was the first cat to check out the new tree right after I brought it into the house. She has been taking her little cat naps in this one just about every day. I featured Bobbie in a post about the Manx cat. I can’t remember if I mentioned that this breed loves to play. Some cat’s desire to play diminishes as they age but Bobbie, even though she is s senior cat, continues to be very playful. Old buddies: Zachary (l) Sassy (r) These 2 cats are almost always together. Carley, loves to sit in the window. This is back lit. I should have used fill flash to illuminate her face. Gweenie is my shyest and sweetest cat. Frankie. A special cat. He has had 2 major surgeries. Very photogenic. Polly about 16 years old. Her expression seems to say, "I know many things... I am old but wise." Do You Allow Your Dog/s to Sniff the Ground When Outdoors? Several weeks ago I read that we, dog owners should allow out pet/s to enjoy themselves more- such as sniffing for all the various scents that our dog/s love. I thought that was rather odd since I just have never given sniffing much thought other than to watch my dogs have fun with their nose to the ground. I read this on an Internet site and their were some comments from readers that, we do not allow our pets much freedom and fun. According to the article, it was the writer’s opinion that sniffing is one huge pleasurable activity in which our dogs should be given more time to engage in and thus have more fun. For some dogs such as the Beagle and other hunting breeds one would think that the dog would constantly have its nose to the ground or concrete- whatever the case might be. I think most dogs- no matter the breed love to sniff. The comments went on to cats where some individuals believed that they were depriving their pet of the wonderment of the great outdoors. I, for one believe that is taking the subject of deprivation to whole new level. Several commenters said they had begun letting their cat go outdoors. Guilt was the deciding factor. Apparently these people did not even begin to realize the perils of letting their cat roam around at will. From experience, I can tell you that many eons ago, my husband would let any cat go out the door that wanted out. I then would chase the cat and bring it back inside. Sad, but true, I “lost” several cats to coyotes and two that were killed by cars. I was finally able to add an addition to the back of the house with a large wire run and have not lost any cats since. My husband did not approve of the addition but I paid for all of it myself. I do not understand the justification for letting an animal roam which can not think for itself anymore than a toddler has the ability to realize all of the inherent dangers of what is lurking at just about every corner. I compare free ranging cats to letting your small child play unattended which could result in the child being kidnapped, killed, or run over by a car. Same thing goes for pet owners who let their dog “potty” anywhere in the neighborhood or cat owners who have never considered the fact that your neighbors might just not like having a cat use their flower bed as a litter box or have paw prints that can clearly be seen going across the hood of their car. I strayed from the original topic- sorry for the digression. I’ll stop with the lecture and get on with the sniffing thing. I am very lucky to live on an acre in the city. Our property was purchased many years ago when there was no one around. Now we are surrounded by homes but our acre is fenced and gated so I can let my dogs run, play, and sniff about every 2 hours or so during the day. I just happened to take some photos of Rocket my old Border Collie as he sniffed his way across our yard one day. Please note: Statistics vary a small amount in various reference articles that I read. The bottom line is to please know your dog, how to recognize the symptoms of bloat, and even if you are in doubt, DO NOT HESITATE. Get -Immediate- Help. Time is of the essence for a favorable outcome of this condition. Hopefully anyone that owns a dog that reads this is a responsible pet owner. Bloat is considered the “mother of all emergencies” as it kills quickly and rapid emergency treatment is critical to the survival of the dog. Okay, so just what is this condition? Bloat or GDV (Gastric- Dilitation and Volvulus), stomach torsion will cause death if do not get your dog to a veterinarian ASAP. Please note: Bloat usually happens in large dog breeds but can rarely occur in small breed dogs such as Yorkies and Chihuahuas, etc. Bloat is almost exclusively seen in large breed deep-chested dogs such as Great Danes, German Shepherds, Greyhounds and Standard Poodles. The theory is that the stomach more easily twists and flips around in deep chested dogs, but the exact cause is not known. Something goes awry as the food is being digested. There is a very rapid build up of gas in the stomach. Imagine a balloon blown up to capacity and about ready to pop. Only the stomach does not pop. It twists and turns so that the the entrance to the stomach and the exit (where food passes into the small intestine) of the stomach is cut off thus preventing the gas that has built up from escaping. If the stomach completely twists, blood circulation is cut off and tissue of the stomach loses it’s blood supply and the tissue dies ( becomes necrotic). This is where the critical stage begins. At this point your dog is likely retching (gagging or trying to throw up (vomit) and as the dog attempts to eject food there will be little or no food at all that comes up. This process can begin fairly soon after your dog has eaten. As the dog continues to attempt to vomit, severe pain is now present and the dog might begin groaning, pacing, panting, frothing or drooling from the mouth, licking at the stomach ,unable to lie down or sit and then will finally collapse if you let it go on too long. Your dog might seek a place to lie down somewhere in the recesses of your house, the garage, or a hidden place in your yard. Your pet will not likely come to you since he/she is in such pain. Your dog will be too ill to move. At this point if you can not get your animal up- get immediate help and carry, or roll you animal over on a blanket and drag him or her to your vehicle. Call your veterinarian or the emergency room as soon as you can use a phone and detail the symptoms. Don’t leave out anything-be sure to let the vet know that your dog had eaten and then became sick soon after and is acting as if in severe pain. The longer you wait to get your dog to a veterinarian the less chance your pet has of a successful recovery. Because there is so much pain involved and blood is not circulting to a crucial body parts, the dog will soon go into to shock (low blood pressure, rapid beating of the heart, and pain) and will die. The heart rate is so fast that it can not sustain the extremely rapid beat for an extended period of time. The hallmark symptoms of a dog with GDV : often a history of recent exercise, eating food or drinking large volumes of water and then repeatedly trying to vomit but not producing any vomitus. The treatment requires rapid intervention. IV fluids will be started along with pain killers. The veterinarian might attempt to pass a tube to see if the stomach has completely twisted and to decompress the stomach. Most likely the vet will take an x-ray just to be certain the stomach is in fact twisted (torsed). Immediate surgery is the only thing that will save your pet if the stomach has already twisted. The surgical outcome depends on a competent vet, how much damage there is to the stomach, and the over all condition of your animal. The surgeon will staple or sew the wall of the stomach to the lining of the abdominal cavity, a procedure known as Gastropexy. This surgery will prevent the recurrence of bloat. About 75% of all dogs that bloat will do so again if they do not have Gastropexy perfomed. Only about 6% will bloat again if the dog has the extra surgery. If you own a high-risk breed, most progressive veterinary hospitals will encourage prophylactic Gastopexy be performed at the age of 6 months (when they are spayed or neutered) to prevent GDV from ever occuring. Bloat is a surgical emergency and treatment and surgery is very expensive (several thousand dollars in some cases) so prevention is cheaper and safer. There are certain steps you can take to greatly reduce or prevent bloat from ever happening. PREVENTION IS THE KEY. Do not feed too much food at one time. If your dog bolts or gulps his food you can purchase a bowl called ” BRAKE STOP” that prevents dogs from inhaling all their food at one time. NEVER take your dog out for vigorous exercise and then feed a large meal or let your pet drink a large amount of water right after exercise. Both of these can cause bloat. Mix dry food with canned food if you can swing the cost. Keep water away at feeding time. Do not allow water consumption right before or right after eating. Give the food time to begin the digestive process before letting your dog drink. Give snacks and biscuits sparingly. These are basically all grain-high carbohydrate. Too much grain is believed to be a contributor to bloat. The dog food should have at least 3% fiber content. Dogs with history of bloat (believed to be inherited) Know your breed before getting a large breed dog. Aggressive dogs. Keep this type of dog also in a place that is free of people and other dogs. Male dogs develop bloat more frequently than females. Do not feed one hour before heavy exercise and DO NOT let your dog out to run one hour after eating. Dogs 7 years and older are more likely to bloat. Do not give Brewer’s yeast, alflfa, or soy bean products. These also contribute to the build up of gas in the stomach. To further reduce the chance of bloat, give your dog acidophilus. I feed my dogs a crushed acidophilus tablet (my labradors are gluttons) mixed in with their food with a little bit of water. Both labs, if I let them, devour their food in less than 2 minutes. To prevent this, I put one cup of food at a time in the bowl and wait a few minutes between each cup. The female is smaller and she gets 3 cups of Purina One and the male who weighs about 90 pounds gets 4 cups. I also feed the labs in a large wire crate so that confinement is not a problem. Yes, it is a bit of trouble but I don’t want to take chances with them. I feed my dogs once a day. I have 8 dogs, so to feed them twice each day would be lots more work but it could be done if I did not have other animals to feed that takes up my time. Purina One just happpens to be the highest quality food that I can afford to feed all my dogs. There are pricier foods on the market. I mention this brand but it is not meant as an endorsement. Part II: A list of dogs that are more prone to bloat. Note: It is possible for any breed to bloat. The Manx cat originated on the Isle of Man which is an island located in the Irish Sea, between Great Britain and Ireland. It is considered an old breed, one that occurred naturally as the result of genetic mutation. The first published breed standard was in 1903. Since that time the breed has grown in popularity as it became better known in Europe and in the United States. Folk lore has said that the cat is part rabbit since it seems to hop even when running. But there is no such thing as half rabbit and half cat. The Manx is unique in many ways other than not having a tail or a partial tail. In formal cat shows the cat is only acceptable for showing if it is tailless- meaning there simply is no tail at all. The tailless specimen is often called a rumpy and a cat with a tail of about an 1-2 inches long is called stumpy. Then the tail thing winds up with some cats that possess half of a normal length tail and these are sometimes called stubbies. Not all Manx cats are born without a tail. Some have normal tail length. These cats love to play and are excellent mousers. It is said that ships of old kept a Manx cat on board to control the rat population. The Manx is also known for its intelligence and are very loyal to their owners. A good specimen should have rear legs that are longer than the front legs which gives this kitty a high rump. All colors are found but an all white Manx is quite a rarity. My own Manx is not anywhere near show quality. She is completely tailless although in the pictures she appears to have a puff for a tail. That fluff is just hair. She is smart and still loves to play even though she is not far from 14 years old. I’m not quite sure of her exact age as she came to me as an adult cat. She had been left outdoors to fend for her self when her owner moved away and left her behind. Bobbie is a very sweet cat and is quite playful at times. She also tries to sneak outdoors and I must always be careful so I put her in a spare room or bathroom if there are people going in and out of the house. To sum it up, the length of tail does not matter unless you are planning to show your cat. A cat is a cat. Each cat has personality just like people and I consider each cat unique regardless of the breed.